Here's a quick look at what an electrical inspector may require you to do. 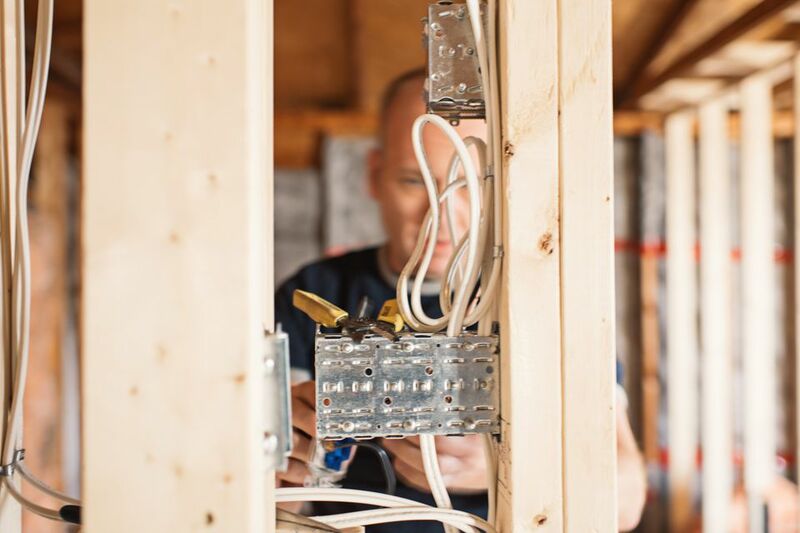 Inspectors will check to see that electrical boxes are flush with the wall and that they are large enough to accommodate the amount of wire that will be in them, along with any device that will be placed within the box. The box should be securely fastened so the device and box aren't moving around. At the point of attachment of the wire to the box, the wire sheath should stick into the box at least ¼” so that the wire strap is attaching to the sheath, not the wires themselves. There should be at least 8" of usable wire length to extend from the box. This allows enough wire to connect to the device and allow future trimming to connect to replacement devices. To aid in connecting the wires to devices, labeling the wires with tape or label tags makes installations a breeze. The label should tell the circuit number, the amperage, and the device that it connects to, like a switch or outlet. If you have delicate electronic devices in your home like TV's, stereos, sound systems, and other such equipment, the inspector may recommend using isolated ground receptacles. This receptacle protects against current fluctuations and interference. Along with isolated receptacles, surge protector, either individual or whole house protectors, will protect these very electronic devices. When planning for surges, don't forget the electronic boards in your washer, dryer, range, refrigerator, and other sensitive appliances. There are some basic electrical codes to live by. First of all, you'll need a work permit before beginning a project within your home. In the case of a new home or new addition, an electrical inspector will need to visit you at least two times. The first is called the rough inspection. This takes place when you have installed all of the boxes and wires to the point that you are ready for the walls to be closed up by wallboard or drywall. This inspection needs to be done before the insulation is installed so that the inspector has a clear view of all of the wirings from here to there. The second inspection takes place when the house is complete, but before you are allowed to move in. This inspection is called the final inspection. At this point, all of the walls are closed in, paint is finished, floors are complete and you are ready to install the furniture. Be sure that all of the circuits are functioning and every light has been hung, especially electrically. This inspection is called the final inspection. Remember, if the inspector approves your work, it means that it meets professional standards and that it is up to code. Inspectors measure outlet and switch heights to see that they are consistent. Typically, outlets, often called receptacles, should be at least 12" above the floor and switches should be at least 48" above the floor. This, of course, is subject to certain allowances. For a child's room or a handicap installation, heights may be much lower to allow for access. Finally, inspectors will check for proper wire anchoring. The wires should be attached to wall studs to secure them. Keep the first staple no father than 8" from a box and then at least every 4' thereafter. Cables should be run through the center of wall studs to help keep the wire from drywall screws and nails. The horizontal runs should be at least 20-24 inches above the floor and each wall stud penetration should be protected by a metal wire protective plate. This plate keeps screw and nails from hitting the wire within the walls when the drywall is installed. To save yourself the frustration and the heartache of making mistakes, ask the inspector the specifics of required circuits and instructions to a proper installation before you begin. He'll appreciate that you want to do it right the first time!